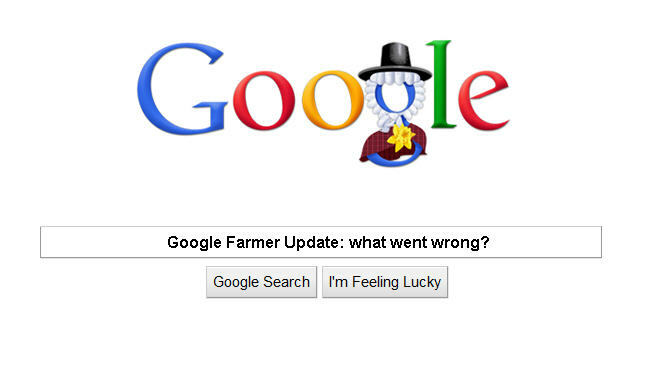 Google Farmer Update: what went wrong? On the evening of 24th February, Google Principal Engineer Matt Cutts promised that a newly tweaked search algorithm that impacted on 11.8% of search queries (an absolutely massive change to the way that search works, in other words) would "reduce rankings for low-quality sites which are low-value add for users, copy content from other websites or sites that are just not very useful" while at the same time producing "better rankings for high-quality sites with original content and information". Nobody would argue that these are good things, exactly what most of would want our favorite search engine to do, in fact. So what went wrong? Well the main thing would appear to be that neither Cutts nor Google has delivered upon the promise that the Farmer Update, as it has become known, would reward high-quality sites. I appreciate that everyone will have a different definition of 'high-quality' content which depends entirely on what it happens to be that they are searching for, and what their expectations are of the resulting hits. However, most people would be more likely to reach a consensus concerning low-quality content, much of it produced by the so-called 'content farms' that churn out huge quantities of poorly put together advertorial driven by whatever keywords happen to be hot at the moment. Yet early analysis of the impact of the Google Farmer Update by search marketing number crunchers at Sistrix would seem to suggest that many of the well known names in the content farming business, far from being hurt by the change have actually benefitted from it. Google is not only judge and jury when it comes to deciding what you really want to search for, it's also just become the executioner for those sites it deems unworthy. Unfortunately, things get worse when you appreciate that Google is more akin to a secret military court than anything else: not only is the definition of low quality content unknown, but the evidence (in the form of that search algorithm) is a secret. Not only does this mean that innocents get caught in the crossfire, but those sites which are so impacted have no real idea of what they have done wrong or how to put it right. Is a ten paragraph article always better than a one paragraph one? No, of course not. Is a complex analysis of a problem always better than a simple explanation? No, of course not. Should a site be punished because other sites have copied their original content? No, of course not. But just look at some of the well known sites which have, according to that same Sistrex analysis, been hit by the changes: the British Medical Journal (a highly respected and long standing medical resource), the Cult of Mac (a busy and very popular Apple news site) and The Well (which pretty much invented online social networking more than 20 years ago). Oh yes, and DaniWeb itself - the IT based support and discussion community where you are reading this. According to DaniWeb Founder and CEO, Dani Horowitz, US-based traffic dropped by close on 70% overnight as a result of the Google Farmer Update after the entire site appeared to be lumped in with the useless content farms by that new algorithm. Not just individual pages or posts within the DaniWeb forum, mind you, but every keyword, site-wide, demoted in the eyes of Google search ranking. Yet DaniWeb is about as far away from a content farm as you could imagine. We are a community discussion and support forum stuffed full of original, in-depth, helpful advice and editorial. DaniWeb itself employs no underhand black hat SEO techniques, it doesn't even meddle in the grey hat stuff. A team of volunteer moderators across continents works around the clock to ensure that any spam, and all forums and websites which allow user contributed content will attract spam, is deleted as soon as it is spotted. The same hard line applies to duplicate content for which we have a zero-tolerance policy. The trouble is that DaniWeb cannot stop others from copying our answers, editorial and claim that content as its own - yet as the original source of this material we would appear to be getting punished as hard as those who steal our words. One thing cannot be denied, and that is with this Farmer Update Google is seriously hurting genuine producers of useful original content while at the same time giving third party content publishers a ranking boost. How that is meant to improve the quality of search is, frankly, beyond me. So, Matt Cutts and Google, if you are reading this maybe you would like to comment as to why innocent providers of high quality original content are being treated so badly? Maybe you could let us know why sites that copy original content are now ranking higher than the sites from which they stole those posts? The problem is what does "thin content" or "content farm" really means and how does Google differenciate it? Isn´t You tube a content farm that possesses a lot of thin content? Isn´t it the same with Ebay? they have a lot of pages with very thin content but nevertheless would never been seen as some - and why? because they surely are no content farms. It would be easier for all webmaster and SEOs if Google would specify the meanings of "content farm" or "thin content" and explain his algo. But this won´t happen so it will be clear that they will be a lot of innocent victims. I would think Youtube, Ebay etc are authoritative off the get-go and shouldn't be affected by regular search engine housecleaning, but they too may be on the verge of crumbling into smitherenes, who knows. Most of the noise in the SERPs lately is revenue generating for the "Internet marketers" of this glorious world to thrive ... for the pennies and nickels to move around ... from one pocket to another. To the trained eye, ad-driven agendas continuously pumping out their monstrocity chug along unscathed. The click for anything intensifies. Searchenginedoids are programmed and yet completely clueless to the workings of their master. all hung up resorting to the mass perpetuation of clicking of the money links. Maybe there's some hope for us still? Yep, if Matt Cutts intervened to get Google to change something as a result of publicity about Cult of Mac (be that algo tweaking, which is unlikely, or some kin d of whitelisting which is more likely) then there must be some hope for other innocents such as DaniWeb. It has over 125 tweets so far, and a handful of comments, so maybe we can spread the word about DaniWeb. One of my blog got 3k unique visitors in a day. Suddenly i lost around 1600 visitors and gets only 1400 visitors yesterday, There is no way other than praying god. Edited 8 Years Ago by Ezzaral: Snipped link. Do not mention, plug or refer to any product, service, or website you are affiliated with anywhere outside of Business Exchange forums specifically designated for this purpose. Following that infamous Feb. 24/2011 algo update, it's obvious that Google doesn't have a clue how to distinguish between original, and scraped content. Apparently, it took a full year of brainstorming by Google's brightest to dream up this embarrassing blunder, where a great many high quality, clean, and original-content sites took a hit. Google may think that it has become too big to fall, but if all the BETTER web sites were to block googlebots from indexing their sites, eventually even non-savy and non-technical web users would notice that Google has blown a gasket, and that they'll have to get relevant and quality search results elsewhere. I have a funny feeling that Google was not expecting this to turn into, frankly, something of a media shitstorm. It was meant to counter the bad press it had been getting for Google search being saturated with content farmed results, but the reality is that the algo update has in many cases made it worse as well as hitting innocents along the way. I honestly cannot see Google trying to ride this one out, and imagine behind the scenes there is a lot of tweaking going on to resolve the problems for sites such as DaniWeb. I'm sure that's true, Davey. But the problem is that, considering they realize that a LOT of innocent sites were caught in the crossfire, they should have the courtesy to roll back the algorithm until it has been properly fixed. In the meantime, there are a lot of innocent businesses out there that cannot afford to keep their doors open one, two, three more days while we wait for Google to fix itself. What pisses me off is that Google has already, or so it would seem, intervened on behalf of one such site, Cult of Mac. I'm no great believer in coincidences of the size of this one; to think it coincidental that Cult of Mac could see traffic halved overnight following the algo update and then see traffic back to normal overnight after Wired featured the story and Matt Cutts tweeted that Google will have seen that, is, well, delusional. "there STILL has been no decrease in bounce rate according to Google Analytics, either globally or when I segment by country and look just at the US." I might have the wrong end of the stick as my head is a bit fuzzled at the moment, but people could have found the landing page useful and then not clicked to another page, so it therefore counts as a bounce anyway and so the pop-up wouldn't make much difference to your stats. I also remember a lot of discussion about how reliable Google Analytic's bounce rate stats are or not. I have my own query on it. How will they find out that which content is genuine? It will be more difficult when a fresh content from a fresh site is used on popular site and get indexed there earlier instead of original site? Any idea??? The bottom line for the search engine is to make profit. Their corporate motto "Do no evil" has been a farce from the get go. Fair play and ethical treatment of a customer's marketing budget are things of a distant past. There are just too many Internet marketers driving their mandates in today's search world and too few educated users who actually understand the advertising programs. Most Internet consumers are completely clueless as to where in fact their search engine advertising money is being distributed. So, how can a search engine stop exploiting the hyperlink at this stage? I don't think in themselves they are able to straighten out. The search engine definitely needs regulation at this phase of its evolution. Things have gone haywire again and there is no one there to protect any of us. Noting that the content you posted on the webmaster's forum over there is right on. Perhaps it's their way of updating so that those who carry adwords can be seen higher so they can make more revenue? Has anyone thought of that fabulous catch-22? Anyhow - wanted to comment here to let you know that I support your site - and am disappointed in the new update. Erm, yes, and your point is? High quality articles from content farms should still be recognized by Google. One way to detect content farms is simply calculate the page dimensions to advertising real estate ratio (or advertising links in a single page). Content farms tend to have around 5 different spam links spread on the page? Maybe more, maybe a little less? And if the content is non unique across all/most pages on the site - BINGO WE HAVE A FARMER! Given that the Google Algorithm is a secret and that most people flounder around changing this and changing that, without any real idea of what will work, perhaps we should try to develop a simulation formula that ranks sites similar to those on Google Search results. There is a huge data set to work with and a large set of variables to try and test. The problem is similar to formulae designed to select stock that are likely increase in value on the stock market. Statistical techniques could be used to test how individual variables contribute to the ranking (PR, backlinks of various types, word count, keyword density, age of the URL, number of pages on the site etc., etc.) Various formulae could be tested for their ability to duplicate the order of the search results. I would be keen to know if anyone has tried to do this and whether it would be worthwhile. Simulation is a proven technique for understanding complex relationships to identify the variables that really matter. I think Bing tried to reverse engineer Google. That was a fail. It seems apparent they used a broad brush for this update. I think it is important to recognize that people build their business on what google allows or does not allow. When they go tweaking things wildly, honest small business people get caught in the cross fire. It's very unfortunate. We been slowly squeezed too, but we fortunately have multiple income sources and a customer base that knows brand, and buys products from us. But I can't say it has been easy. Google is not what is was when it started. It is a corporation now, that is mostly governed by profits so as to please the stockholders. It is probably reaching a peak in terms of people liking it, and now depends on its dominance, which is a far different strength than the love of users who grew their business alongside google. I actually see a free Internet Explorer 9 download. Informative postings, thanks a lot. Is there any new search algorithm update in 2015 ?